One of Loudoun County’s favorite Thanksgiving traditions played out Monday evening at Guilford Elementary School. 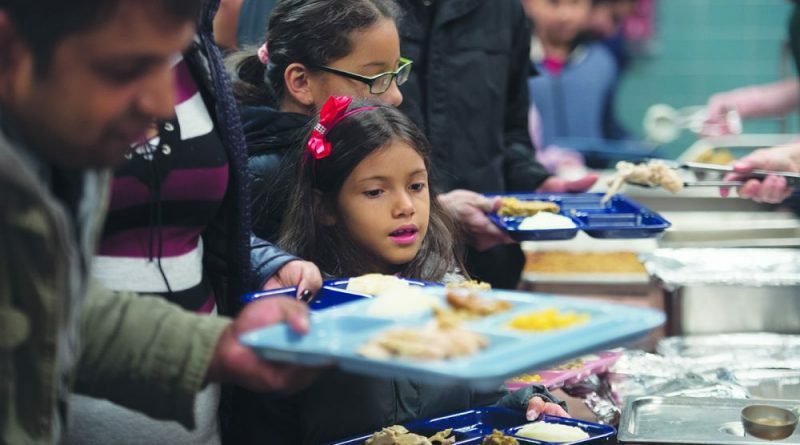 Each year, the school opens its doors for a Thanksgiving feast and invites everyone in the neighborhood to take part. On Monday, an estimated 700 meals were served. The annual feast takes an army of volunteers and donors to put on. Guilford’s staff served as helpers, greeters and arranged the cleaning, planning, parking and took care of the shopping for the event. They also volunteered to cook turkeys at their homes ahead of the event. Even the students helped out, supplying decorations for the cafeteria. Donations poured in from several organizations and businesses, including: Reston Bible Church, which gave 100 pies and 170 boxes of stuffing; Sterling Methodist Church, which gave 40 turkeys; Park View High School, which donated 10 turkeys; Delta Sigma Theta Sorority which provided 335 cans of corn, 250 boxes of potatoes, 250 packets of gravy; and Home Depot, which provided safety vest and flashlights for parking volunteers. Each family attending the event received a free family photo courtesy of Cotton Photography and Jonathan Gusman.